Great Plains Disaster Response is a ministry of care that has theological, material, mental health, advocacy and social service components designed to provide for the spiritual, emotional and physical recovery of disaster survivors. As our spring storm season approaches, please consider donating to this ministry! It is because of your prayers and financial gifts that we can be the “hands and feet” of Christ to all people in the Great Plains Annual Conference. 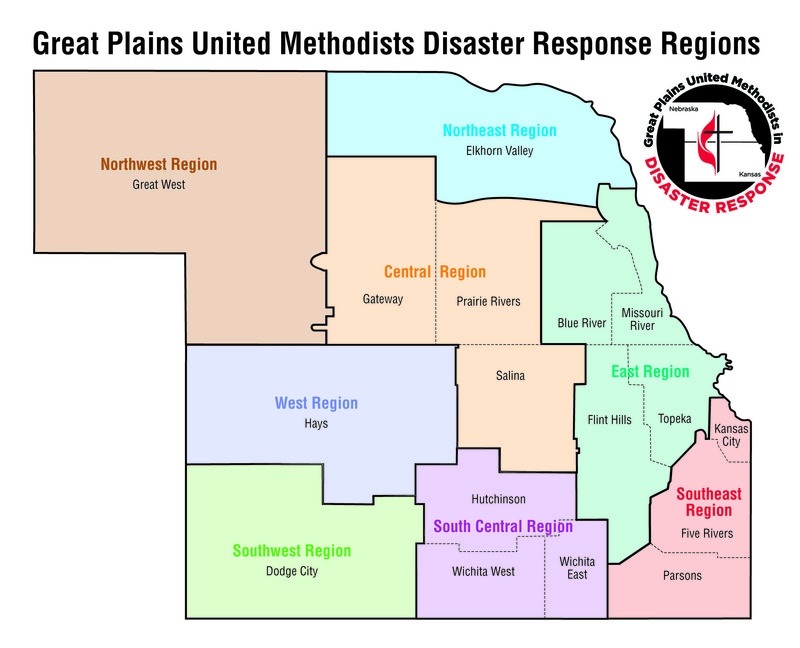 Our Disaster Response Committee is comprised of United Methodists from across Kansas and Nebraska, working together in the Great Plains and beyond to provide trained teams of caring people to respond when disasters occur. The Great Plains Conference has a Conference Disaster Response Plan for responding to disasters within the geographic bounds of the states of Kansas and Nebraska. 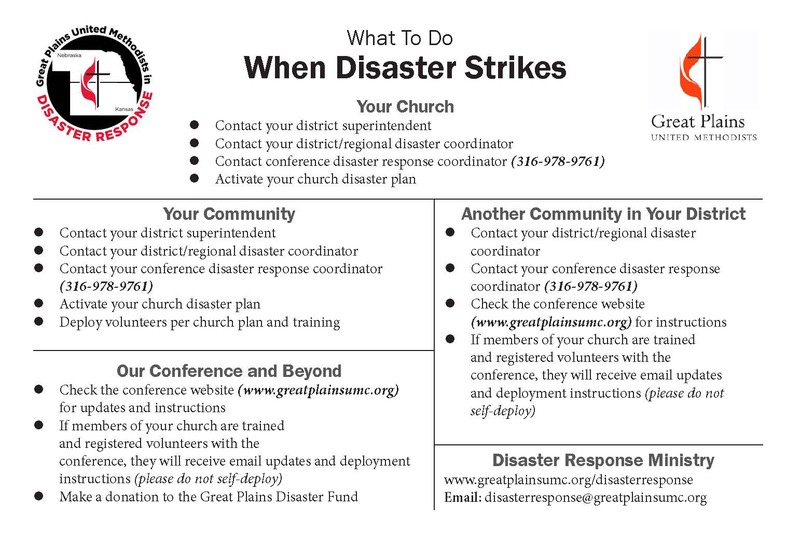 Every local congregation also is encouraged to develop a Local Church Disaster Response Plan for local emergencies. Basic Disaster Response 101: This is an informal session for anyone desiring to work in the long-term recovery phase of disaster response. Teams will be called upon by the conference disaster response coordinator through regional or district coordinators. Early Response: Train on how to help people and communities immediately after a disaster strikes. Learn more. Spiritual & Emotional Care: While some people need medical care to heal physical injuries after a disaster, many more need spiritual and emotional assistance after a crisis. Learn more. Active Shooter: Plan as best as possible to prevent an active-shooter scenario in your church, and learn how to respond should such a situation arise. Learn more. Children & Youth After a Disaster: Learn what to look for and how to respond after children and/or youth have experienced a disaster. Family Disaster Planning: Find tools to help families design and make their own preparations for a disaster. Connecting Neighbors: What if America’s greatest asset — its faith-motivated and God-centered people — rose up to embrace the belief that protecting people, places and ministry is our responsibility? What if we saw preparation and planning to be equal partners with building projects and new fellowship halls? What if we understood that stewardship of our bodies (eating healthy foods and exercising) and stewardship of our gifts (teaching, praying, tithing) are twin pillars supporting stewardship of our church family and church home to become the best gifts we have to give to our communities when trouble comes? If we were to embrace stewardship of our church family and church property in advance of emergencies, we might be the engineers of new beginnings in our communities, the source of hope for ourselves and the visible evidence of our commitment to being the hands and feet of God’s ministry on Earth. The Great Plains Disaster Response Ministry can help you make this a reality. The United Methodist Committee on Relief (UMCOR) had developed a tool to get us started in our preparations. There are three modules, which can be stand-alone trainings themselves or in combination of one another. Each module begins with a 30-45 minute Disaster Ministry Overview, during which participants will understand how our United Methodist structure enhances the local church’s capabilities for disaster readiness and response. Module 1: Ready Congregants focuses on preparing individuals and families to be disaster-ready. Objectives: Participants will be inspired to take action to prepare themselves, their households and others before and immediately following a disaster. Time: 2 hours of training. Target Audience: Everyone. Module 2: Ready Churches emphasizes the importance of protecting church property and the people within the property, before and immediately following a disaster, and of appropriate use of church property in disaster response. Objectives: Participants will (1) identify one or more steps to take in order to mitigate against disaster-caused damage to property; (2) identify one or more steps to take to prevent harm to people who are present in or on church property when disasters or emergencies occur; and (3) be able to assess the utilization of church property following a disaster within or near the community of the church. Time: 2 hours of training. Target Audience: Everyone, especially church leaders including, but not limited to, pastors, trustees, Sunday School superintendent, lay leader, church disaster coordinator, missions coordinator, treasurer, finance committee members, young adult, youth representatives and others. Module 3: Ready Response encourages churches to explore their capacities for various disaster response ministries and to consider ways to engage community partners. Objective: Participants will (1) be able to identify at least one disaster ministry their churches might be willing and able to implement before and/or after a community disaster; and (2) initiate a preliminary plan to engage the church and to cooperate with other households of faith and the community in order to be prepared to respond in the event of a disaster. Time: 2 hours of training. Target Audience: Everyone interested in disaster-ready congregations and communities, particularly disaster, mission and outreach personnel, lay leaders, United Methodist Women, United Methodist Men, youth ministry leaders, lay servants and Stephen Ministers. To schedule one or more of these module trainings and/or for more information, contact Rev. Hollie Tapley, Conference Disaster Response Coordinator, at htapley@greatplainsumc.org. 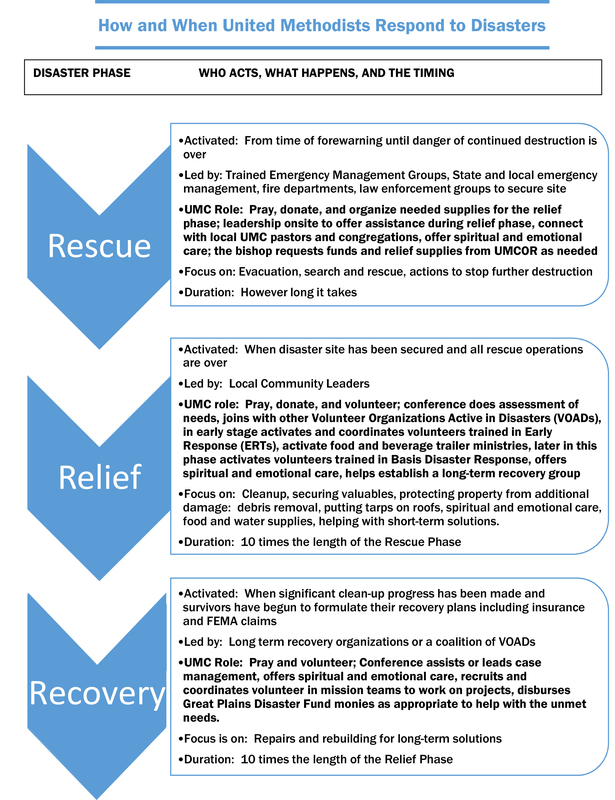 Volunteers In Mission (VIM) teams are essential to the long-term recovery process following a disaster. Training classes are conducted for VIM teams and team leaders. For more information and/or to schedule a VIM training, contact Rev. Kalaba Chali at kchali@greatplainsumc.org. Conference disaster funds may be requested by any United Methodist pastor or by any conference, regional or district coordinator for any resident affected by a disaster, regardless of church affiliation. Donations are the sole source of funding and may be made at any United Methodist Church or mailed to the Conference Treasurer's Office, PO Box 4837, Topeka KS 66604-0837. Mark your checks fro "Disaster Response." If you would like more information, or if your congregation is interested in disaster response training opportunities, contact the Rev. Hollie Tapley, disaster response coordinator, at 877-972-9111 or htapley@greatplainsumc.org.